You may have seen Corot’s famous landscapes, well known all over the world but you certainly do not know his figurative paintings. The Musée Marmottan brings together sixty works of its figurative paintings, loaned by prestigious museums and private collections in Europe and the USA (London’s National Gallery, the Metropolitan Museum in New York, the National Gallery of art in Washington, the Thyssen-Bornemisza Collection in Madrid, the Kunsthalle in Hamburg, the Belvedere in Vienna, the Louvre and the Bührle Foundation in Zurich etc.) 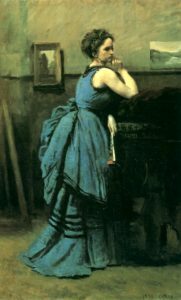 to show the most intimate, secret and modern aspects of Corot’s works. and a lot of other splendid and rarely seen nudes to discover.